Miami WFO at Miami International Airport reporting rain and 58 degrees at 1 p.m. That is about as raw as it gets down that way. northjaxpro wrote: Miami WFO at Miami International Airport reporting rain and 58 degrees at 1 p.m. That is about as raw as it gets down that way. 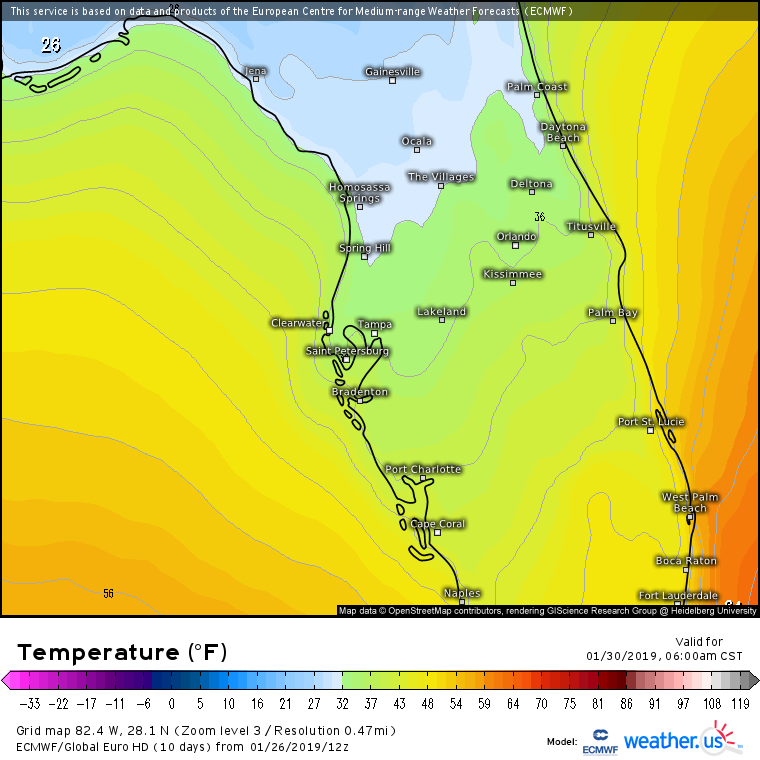 12z Euro to continues to trend warmer for Central FL, no longer it shows a freeze for the Orlando and Tampa area. When we think of this period of below normal temps taking the form of a severe cold invasion with a damaging freeze or a protracted period of chilly (but not damaging) weather it looks as if the latter is winning out. That is definitely a positive. If the extreme cold residing over the Midwest came slamming straight south it would be a cat 5 winter event. Florida is painted in a light shade of orange on the latest 8-14 day outlook as the cold retreats. Giddyup. psyclone wrote: Florida is painted in a light shade of orange on the latest 8-14 day outlook as the cold retreats. Giddyup. Good. The warm weather can't come soon enough for me. I get chilled just looking at the latest 18z GFS of what our neighbors to the North will be experiencing here shortly. 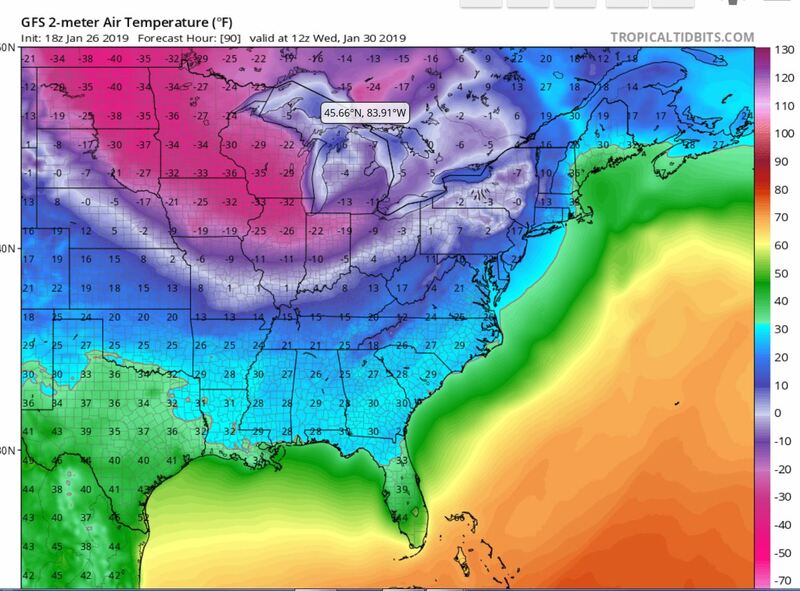 It looks like Chicago may see 28 below zero if this run verifies. Cold, windy, rainy today. 53 and windy with rain in St. Petersburg. 45 degrees with steady rain here. Temps will be pretty much holding in the upper 40s most of today here in Jax area with northeast wind increasing later today as Low Pressure organizes near the Florida Keys. This Low will move northeast and head off the Florida East Coast later tonight and out into the Atlantic. This is in response to the upper shortwave axis, which is currently in the Central GOM, and will cross North Florida by 06Z tomorrow morning. I will be heading to the movie theater in a couple of hours and it sure is the perfect type of day to do it. Rain will be steady all day, even heavy in spots across especially along and north of the Interstate 4 corridor. This is definitely about as raw as you can get it here across the peninsula. Freeze potential still on track for Wednesday and Thursday mornings across North Florida. I will be closely monitoring guidance regarding temps. Runs currently showing upper 20s to lower 30s across inland North Florida, especially for Thursday morning. The Pro Bowl game will be an absolute mess this evening down at Camping World Stadium. This is not the type of day the Orange County Chamber of Commerce folks envisioned that is for sure. I know it's subjective but today is likely to go down as the most miserable day of the winter. Uniquely awful. Now for the good news. It's always darkest before dawn. We have fended off the arctic monster. A much milder pattern is now coming into view. Both the 6-10 and 8-14 day show temps on the warm side of average and those averages are now increasing thanks to strengthening sun and lengthening days. After we endure this next week of below normal temps a milder pattern will take over starting next weekend....and it is destined to be glorious.. I had to work today and I got drenched. My co-workers from up north think that is not too bad despite the rainy day today, at least is much warmer than up north, the sun is coming back tomorrow so that will make it feel much better. I can't wait for next weekend, near 80 degrees! Don't get too comfy with the warm up next week. I have a feeling the PV will pay the U.S. another visit mid-Feb with the Troposphere finally being receptive after a brief set-back early next month! The coldest Feb min for Orlando is I believe 20 degrees F! Currently 43.4 degrees. It is still raining steady here at 3:45 a.m. this morning. Talk about a complete wash-out on Sunday. It has rained non-stop since just after 1:00 a.m. yesterday morning, more than 27 consecutive hours. I just braved the cold rain to check the gauge and just under 1.75 inches have accumulated to now. Probably will see over 2 inches when it is all said and done. The models as late as Friday afternoon did not have the Jax area and NE Florida getting anywhere close to this much rainfall. It was the late afternoon runs beginning after 18Z last Friday that the models did a sudden about face and finally grasped the dynamics and the upper shortwave axis in the GOM. What was initially thought to have been just a soaking rain confined only for South Florida turned into a statewide soaker. It turned out that we had a multiple waves of disturbances that traversed the southern jet during yesterday that really got us pretty good. Temps stayed in the mid-upper 40s all day here and in the 50s across Central Florida.with a cool, stable air mass in place over the peninsula. It truly was a cold, raw, and wet yesterday for everyone. The upper shortwave axis is currently crossing North Florida at this hour. It should be just east of the peninsula by 8 a.m. this morning. The rain should come to an end. The respite from the rain will be very brief however. The next polar cold front will approach rapidly from the northwest by early Tuesday morning. The forcing and lift from the front will generate rain once again across North Florida later on Tuesday and onto Tuesday evening. I have been monitoring over the past several days to see if moisture would linger behind the frontal passage for late Tuesday night into early Wednesday. The models, especially the GFS, were consistently showing that possibility up until this past Saturday. They have since backed off on showing that possibility of flurries herewith colder air filtering into the region early Wednesday. Still on track with freezes across the Northern Florida area, with an advective freeze on Wednesday morning likely across this region and another possible freeze on Thursday morning. We may see lighter wind on Thursday morning. However, one caveat is that models are showing yet another shortwave disturbance developing in the Western GOM early on Thursday. This may bring high cirrus clouds along the southern jet on Thursday morning. This may be a big saving grace to possibly spare some locales overthe region of a freeze on Thursday morning. I will monitor that . Yes, a warm-up is on the way beginning next weekend. It will feel spring-like when it comes into effect next week. However, I am in agreement with FlaWeatherDude in that winter is far from over up here yet. We still have about a good six-week window here across North Florida for potential cold spells. I look for a potential return of Old Man Winter as we reach the middle of February. I still have a feeling we will get a decent cold spell across the Eastern CONUS and into the Deep South within the next 2 weeks or so. I can not truly start the spring countdown living here in Northeast Florida until we get past mid-March at the earliest, as opposed to the rest of you down state. We can still get freezes across the northern peninsula as late as into the first week in April. Looking like there was a tornado touchdown in Dade County last night as the squall line moved through. Reports in Hialeah of building damage and cars moved and possibly overturned, as well as tree damage. mass expected Tuesday and Wednesday east of the area fairly quickly. If this is correct...along with the calendar...we're likely done since February is a front loaded month wrt freeze threats. Time will tell.. I hope it warms up- yesterday’s 40s fahrenheit temperatures, windy, and rainy weather was cold enough for me- in fact I even caught a bit of a stuffy nose from it. Euro shows some warmer weather down the road. Hope it verifies. According to Cuban sources, the tornado produced either F3- or F4-level damage. (Cuba still utilises the old Fujita scale.) The strongest known tornado to affect Cuba hit Bejucal on 26 December 1940 and produced F4-level damage. Strong extratropical cyclones have also generated severe squall lines in Cuba during El Niño years such as 1982-83. The March 1993 Superstorm affected western Cuba as well as the Florida peninsula. psyclone wrote: I know it's subjective but today is likely to go down as the most miserable day of the winter. Uniquely awful. Now for the good news. It's always darkest before dawn. We have fended off the arctic monster. A much milder pattern is now coming into view. Both the 6-10 and 8-14 day show temps on the warm side of average and those averages are now increasing thanks to strengthening sun and lengthening days. After we endure this next week of below normal temps a milder pattern will take over starting next weekend....and it is destined to be glorious..
Spring is visible through my pollen covered windshield. We can watch things evolve but the First half of February is looking good at this point..